High blood pressure is a health risk for anyone. It can lead to stroke by damaging and weakening your brain's blood vessels, causing them to narrow, rupture or leak, and can also cause blood clots to form in the arteries leading to your brain, blocking blood flow and potentially causing a stroke. But even small increases in blood pressure are especially risky for African Americans. Studies show that when blood pressure among African Americans increases even as little as 10 mm Hg, it increases their risk of dying by 12 percent. The risk increases to 26 percent for black people under the age of 60. Cardiologists agree that the study indicates the need to treat high blood pressure differently among African Americans than among whites. 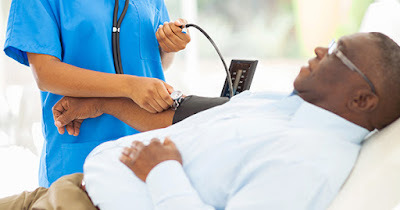 Although the blood pressure goal set by the U.S. National Institutes of Health Eighth Joint National Committee is currently a target of less than 150/90 mm Hg, the goal is based on clinical trials that often do not include blacks. Even the National Heart Association believes this goal is set too high. The results of a 9-year study of 5,200 all black people in the Jackson Heart Study between 2000 and 2011 in Jackson, Mississippi, showed that every "10 mm Hg increase in blood pressure caused a 12 percent increase in the risk of death, and a 7 percent increase in the risk of being hospitalized for heart failure,” according to lead researcher Dr. Tiffany Randolph. For this group, the recommended blood pressure was set lower. The study was important in highlighting not only the need to live healthy but to address the needs of adjusting blood pressure levels for different groups of people.